SCOTLAND’S leading stage actor of his generation, John Clyde, who died at his daughter’s home at 34 John Street, Helensburgh, on November 1 1920, also had the accolade of being Scotland’s first film star. Father of film actors Andy and David Clyde, and stage star Jean Clyde, John was the best known actor-manager of the 19th century in his home country — but only the most ardent film buff is aware of his place in cinema history. Rob Roy was his most famous part on stage, and he transferred it to the screen in September 1911 in the black and white silent film of that name. It was directed by Arthur Vivian for producer James Bowie, and was the first three-reel movie made in Scotland. It lasted about 45 minutes, and it held the record as the longest movie drama for a year. A year earlier, William John Bendon had founded Scotland's first film studio at Rouken Glen, Glasgow, based in a disused tramway depot. Its power supply still came from the tramway power station, so one tram passing meant the light faded, and two trams passing meant filming stopped. The studio's first two films were unsuccessful, but in 1911 the film Rob Roy, based on Sir Walter Scott’s novel, was made there, with a location trip to Aberfoyle. Also in the cast were Theo Henries as Rob Roy’s wife Helen, opera singer Durward Lely, W.G.Robb and George Hunter. Anne Wade, of the Glasgow-based Scottish Screen Archive, does not believe that any copies of the film exist today. “It is unfortunately on our list of films ‘missing, believed lost’,” she said. 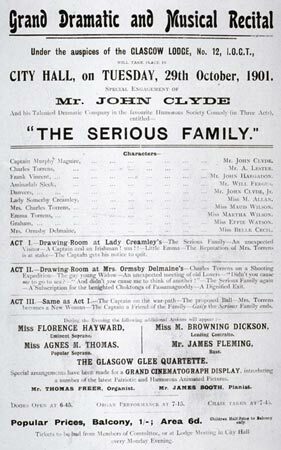 But it was on stage that John Clyde, who born in Rattray, Blairgowrie, Perthshire, on November 20 1860, made his name. He married Glasgow-born Mary Allan on June 4 1884 in Glasgow, and they had six children. When they moved to Helensburgh, by 1890, they are thought to have lived for a time in Ardencaple Farm which was actually in Rhu. The couple had six children, who were . . .
■ John McIntosh Clyde, born in Glasgow on December 26 1884 and killed in action in France in the First World War on December 11 1916. He was known as Johnny. ■ Mary Clyde, born in Glasgow on May 6 1886, who married a Helensburgh man, Adam Bain Paton, and they had one child. She died in Glasgow on April 16 1954. She ran the M.Clyde confectioners shop at 41 Sinclair Street. ■ David Clyde, actor, born in Glasgow on May 27 1887, died on May 17 1945 in the San Fernando Valley in California. He married Birmingham-born actress Fay Holden, who died on June 23 1973. ■ Jean Clyde, actress, born in Glasgow on March 17 1989, died in Helensburgh on June 24 1962. She married twice, actor David Urquhart who was lost at sea, then Edward ‘Bill’ McQuaid from Wishaw, who died in Glasgow in 1949. ■ Andrew Allan Clyde, film actor, born in Rattray on March 25 1892, died in Hollywood, California, on May 18 1967. He married Londoner Elsie Maud Tarran in San Bernadino, California, on September 23 1932 and they had one child, John, born in 1935 and died in 1944. ■ Helen Geral dine (Nell) Clyde, was born in Glasgow on December 16 1895, and died in Helensburgh on June 3 1985. She married Robert Watson from Glasgow in 1917 and they lived in Helensburgh, where he died in 1957. They had one son, Robert, born in Helensburgh in 1922. When Jean retired from the stage and returned to the burgh she lived with Nell in 34 John Street, where her father had died after being nursed by the family for three months. John Clyde ran a touring theatre company, presenting seasons of Scots plays — particularly Rob Roy — and in the company at various times were Johnny, David, Andy and Jean. Jean started her stage career at the age of six months, when she was carried on as the child in Jeannie Deans during one theatre tour. Her first real tour was around Scottish towns with Rob Roy. “Looking back on it, I wonder how I ever managed to do it. I was my father’s right-hand ‘man’ in those days,” she said. “Though I was much younger than my brothers, my father seemingly thought I had a better business head, so I had to look after the management side of the show — supervised by father, of course. I wasn’t old enough — maybe I wasn’t good enough — to play a part, but I went on and danced a Highland fling. 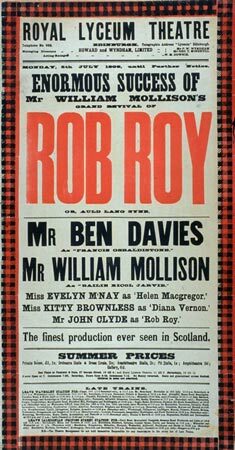 John made his first appearance as Rob Roy, at the Lyceum Theatre in Edinburgh, and his final public appearance was at the King’s Theatre in Edinburgh in the same part. He brought his company to Helensburgh's Victoria Hall in 1911 with 'Jeanie Deans, or The Sisters of St Leonards', and the Helensburgh and Gareloch Times reported that the hall was well filled, which went to show that his annual visit to the town was as popular as ever. The paper reported: "The company was a very powerful one indeed, and Mr Clyde was very happy in the role of Laird of Dumbiedykes, showing a fine conception of the old Scottish language. "The whole of this popular Scottish drama was played in four acts, and we were well pleased with this version of it. We may also say that Mr Clyde still ranks as one of our foremost actors. On the whole the play was a pronounced success, and will no doubt draw large audiences wherever it goes." “Everyone in Helensburgh and thousands of lovers of the drama the world o’er — particularly Scotch pieces — will learn with profound regret of the death of Mr John Clyde, actor-manager, which took place at the residence of his daughter, Mrs Watson, 34 John Street, on Monday night. “Deceased had been in failing health for several weeks and, although he made an occasional rally, lately it was seen that the end was not far off. “A native of Blairgowrie, Perthshire, he was a draper by profession. In early life he felt the fascination of the boards and, burning his boats, left trade behind. At once almost, he leaped to fame — he never played small parts — scoring splendidly as Rob Roy, his first part. “Of powerful physique, and a brilliant delineator, he was considered the finest Rob Roy that Scotland has produced for half a century. Roderick Dhu is another favourite character, and in this too he shone. “Indeed, for the long period of 33 years, he had been an outstanding figure on the Scottish stage. He represented what was best. “He frequently collaborated with Durward Lely, and together they did splendid work. “And so, after a long, honourable, and praiseworthy record before the footlights, the curtain has been rung down. John Clyde, a big man in all the ways, has appeared before us for the last time. The funeral was private, and a legal notice the following week inviting any claims to be lodged described him as John Clyde, of 3 Rockhill Terrace, Dunoon, and latterly of 34 John Street, Helensburgh. Nothing is known of the reported second wife and the little girl — perhaps they lived at the Dunoon address. A report in the Scotsman in December 1920 states that the estate of the well-known actor-manager John Clyde was lodged with the Sheriff Clerk at Dumbarton and amounted to £4,307 (roughly £125,000 today). His brother, Rattray-born Robert McIntosh Clyde, set up the Clyde grocery business in Helensburgh, which had branches in West Princes Street and Sinclair Street, in 1892 and died at his home, Bramwell, West King Street, on Christmas Day 1947, some 26 years after he retired. Two descendants of the Clyde family still living in the burgh are Lieutenant Commander Gill Aitkenhead MBE, Vice-Lieutenant of Dunbartonshire, and whisky executive Alistair Paton. 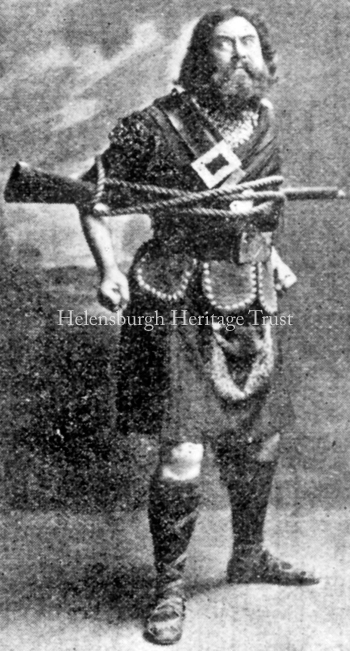 The photo of John Clyde as Rob Roy, a publicity image from the film published in a cinema trade magazine around 1911, is published by courtesy of the National Library of Scotland; the theatre posters are the property of Glasgow University Library.